A vibrant toe-tapping musical set in the roaring twenties. 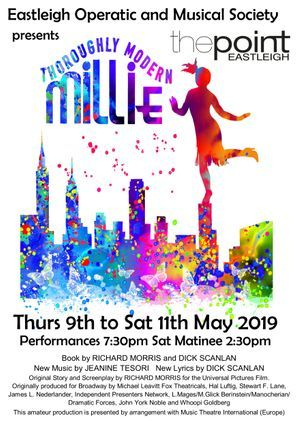 Feisty young flapper Millie plans to find a job and marry a wealthy employer. Though fond of a penniless salesman, she is determined to marry the boss, who happens to be in love with illie’s friend. As all four search for love, evil Mrs Meers schemes to sell the girls into white slavery. Eastleigh Operatic and Musical Society (EOMS) has been entertaining audiences for many years with a wide variety of musicals and concerts, and we currently perform two shows a year at The Point, Eastleigh. We are a lively and friendly group and new members are welcome, whether you would like to join the society as a chorus member, a potential principal, or to help back stage. New performing members normally join during the first few rehearsals for each show. Sell-out audiences at The Point enjoyed EOMS production of Oliver! from Tuesday 20th to Saturday 24 November 2018. Directed by David Humphries, with musical director Rob Jones and choreographer Dawn Broomfield. Congratulations to all involved! £276 was raised in the retiring collection during the week for our chosen charity - the NSPCC. Footlights Youth Theatre's production of Cole Porter's madcap musical Anything Goes ran to standing ovations at The Point, Eastleigh, Wed 21st to Sat 24th March 2018. Congratulations to all on a wonderful show! Eastleigh Operatic and Musical Society's SISTER ACT ran from Tuesday 21st to Saturday 25th November 2017 at The Point, Eastleigh. at the Berry Theatre, Hedge End, Thursday 27th to Saturday 29th July 2017. Following the success of Les Miserables in March 2016, FYT presented a spectacluar production of Evita on their return to The Point. The story of the short rags-to-riches life of Eva Peron, this acclaimed West End and Broadway show features music by Andrew Lloyd Webber and lyrics by Tim Rice. The show ran from Tuesday 7th March to Saturday 11th March 2017. EOMS concert production "Extravaganza Of Musical Shows" ran from Thurs 24th to Sat 26th November 2016 at The Point Eastleigh.